Seventeen reports make up this set: a cross-state trends report and project overview and look-fors document, plus 15 profiles of each state’s leadership efforts to support professional learning on college- and career-readiness standards. In this report, SREB’s Benchmarking State Implementation of College- and Career-Readiness Standards project studied state efforts in 2014-15 and 2015-16 to foster effective professional learning for educators on state college- and career-readiness standards in English language arts and math, K-12. SREB uses the findings of this study to provide state leaders with actionable feedback on and support for their work, to inform the continuous improvement of state education policies and practice. In collaboration with SREB states and professional learning experts, SREB identified four major areas in which state education agencies and other state leaders pro vide leadership and support local efforts to deliver high-quality, standards-aligned professional learning that meets the needs of all teachers in service of helping all students master the standards. SREB’s analysis of how states have carried out work in each area forms the basis of this study. 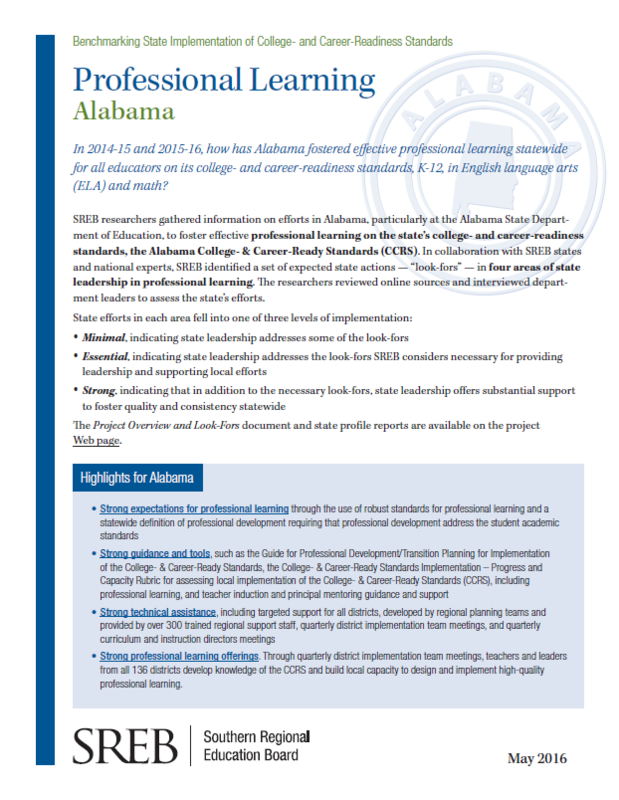 SREB researchers gathered information on efforts in Alabama, particularly at the Alabama State Department of Education, to foster effective professional learning on the state’s college- and career-readiness standards, the Alabama College- & Career-Ready Standards. In collaboration with SREB states and national experts, SREB identified a set of expected state actions — “look-fors” — in four areas of state leadership in professional learning. 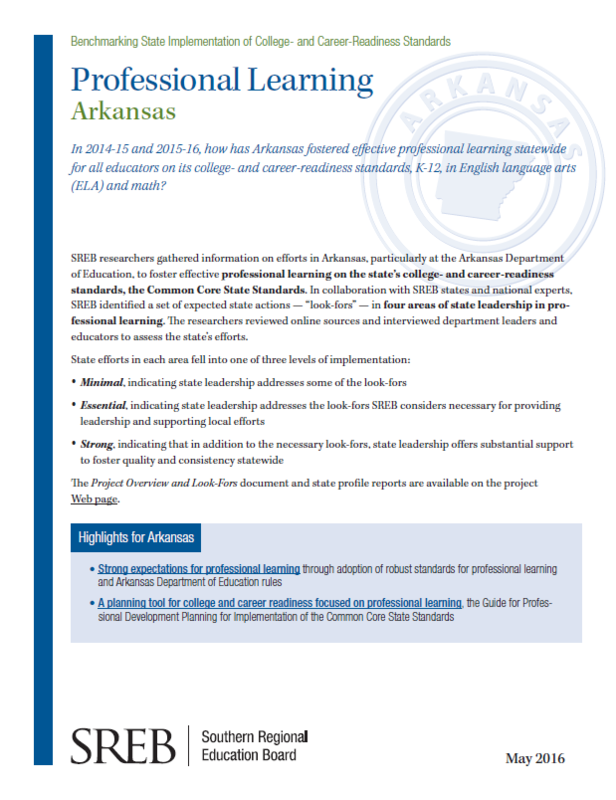 SREB researchers gathered information on efforts in Arkansas, particularly at the Arkansas Department of Education, to foster effective professional learning on the state’s college- and career-readiness standards, the Common Core State Standards. 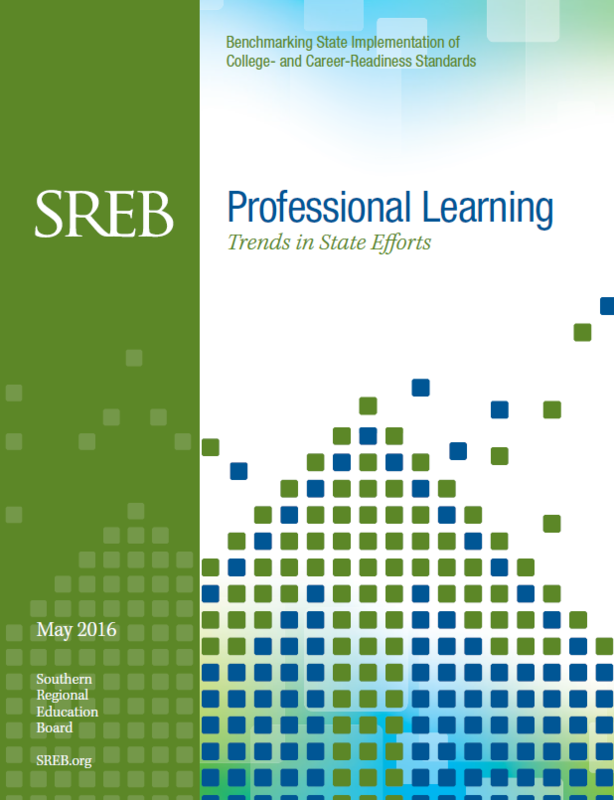 In collaboration with SREB states and national experts, SREB identified a set of expected state actions — “look-fors” — in four areas of state leadership in professional learning. 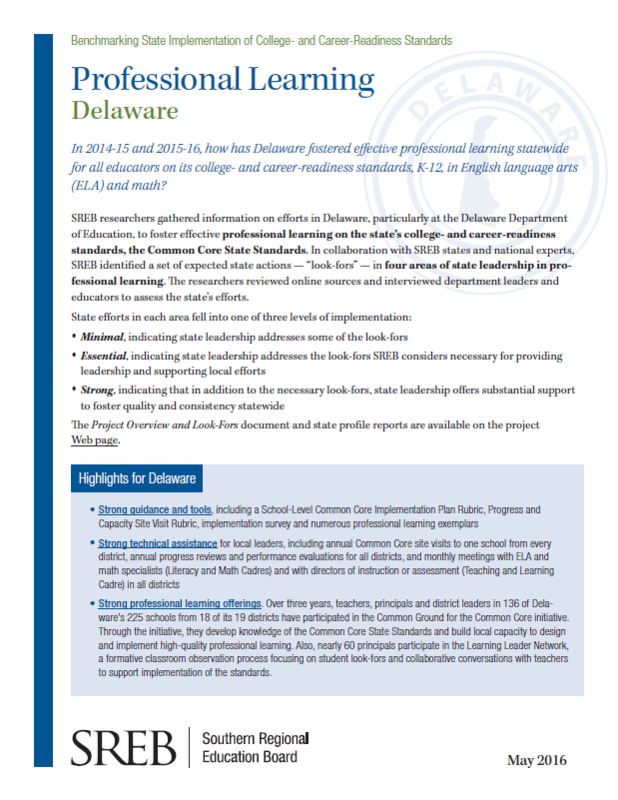 SREB researchers gathered information on efforts in Delaware, particularly at the Delaware Department of Education, to foster effective professional learning on the state’s college- and career-readiness standards, the Common Core State Standards. In collaboration with SREB states and national experts, SREB identified a set of expected state actions — “look-fors” — in four areas of state leadership in professional learning. 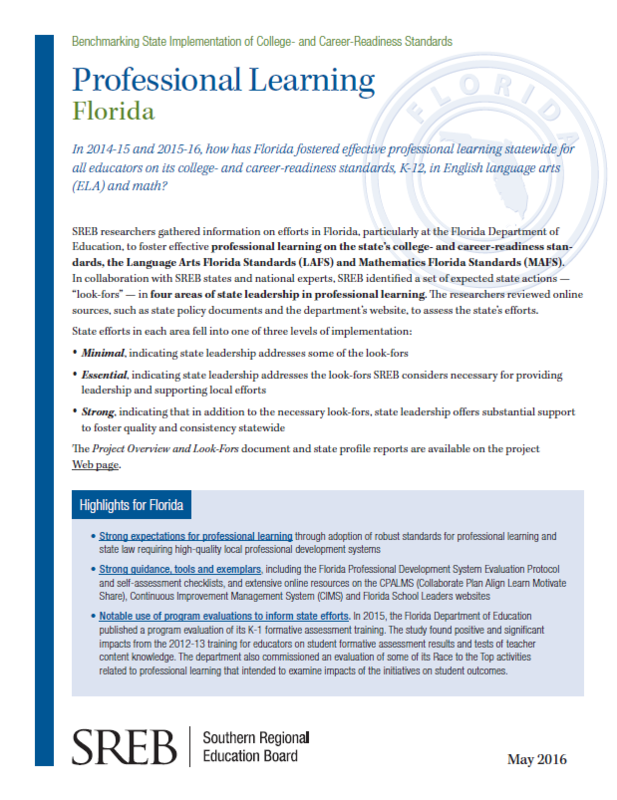 SREB researchers gathered information on efforts in Florida, particularly at the Florida Department of Education, to foster effective professional learning on the state’s college- and career-readiness stan-dards, the Language Arts Florida Standards and Mathematics Florida Standards. In collaboration with SREB states and national experts, SREB identified a set of expected state actions — “look-fors” — in four areas of state leadership in professional learning. 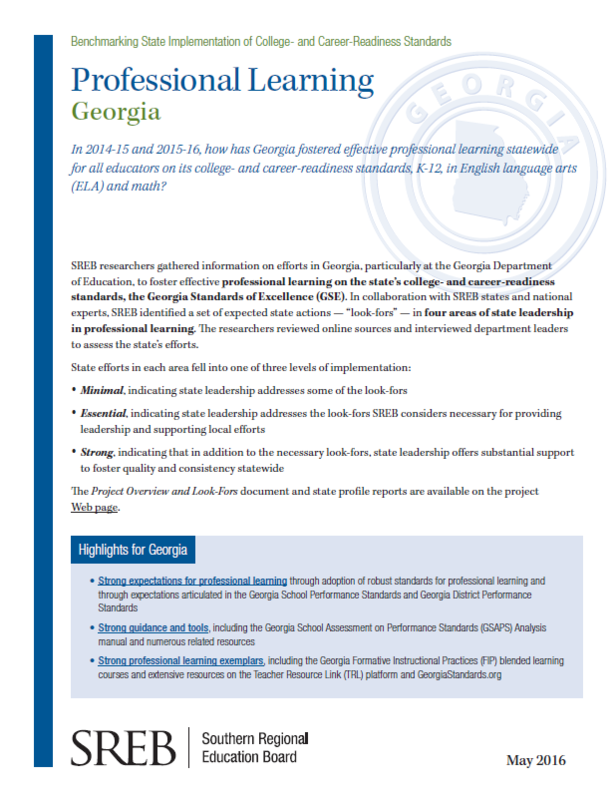 SREB researchers gathered information on efforts in Georgia, particularly at the Georgia Department of Education, to foster effective professional learning on the state’s college- and career-readiness standards, the Georgia Standards of Excellence. In collaboration with SREB states and national experts, SREB identified a set of expected state actions — “look-fors” — in four areas of state leadership in professional learning. 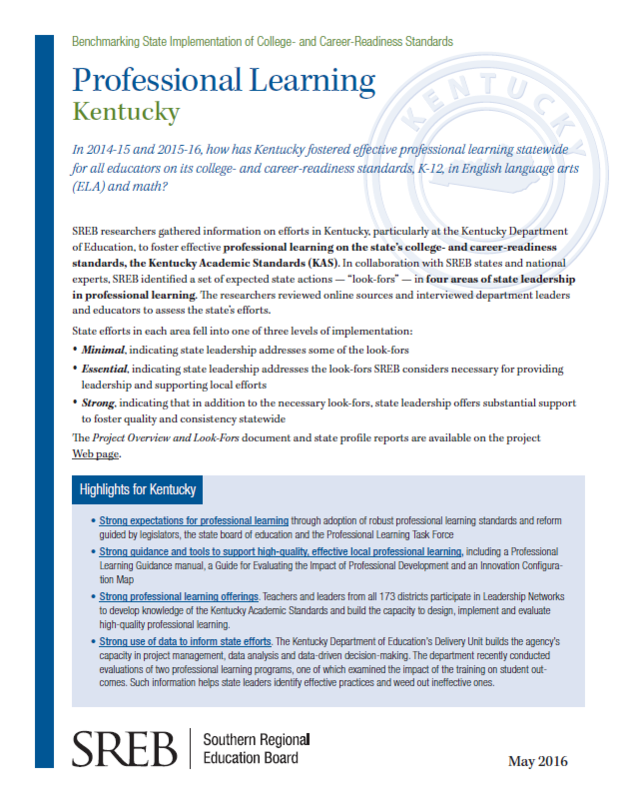 SREB researchers gathered information on efforts in Kentucky, particularly at the Kentucky Department of Education, to foster effective professional learning on the state’s college- and career-readiness standards, the Kentucky Academic Standards. In collaboration with SREB states and national experts, SREB identified a set of expected state actions — “look-fors” — in four areas of state leadership in professional learning. 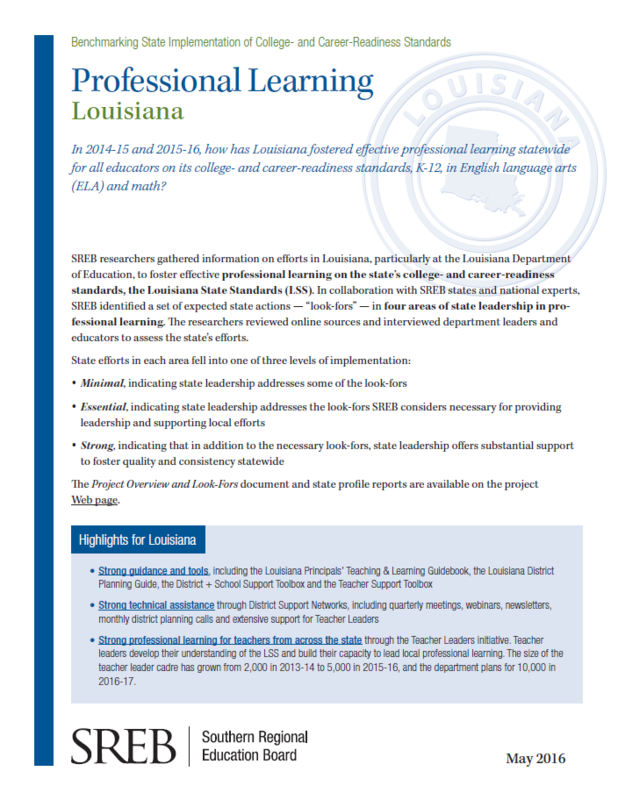 SREB researchers gathered information on efforts in Louisiana, particularly at the Louisiana Department of Education, to foster effective professional learning on the state’s college- and career-readiness standards, the Louisiana State Standards. In collaboration with SREB states and national experts, SREB identified a set of expected state actions — “look-fors” — in four areas of state leadership in professional learning. 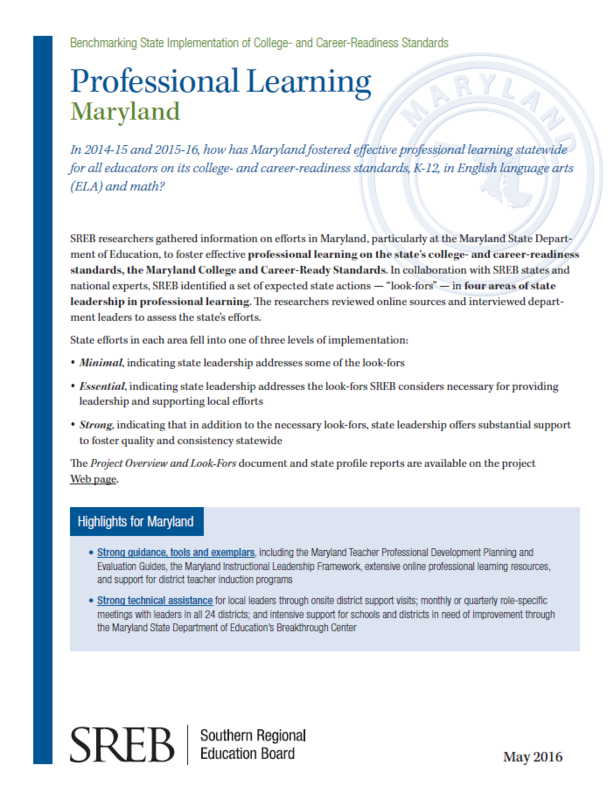 SREB researchers gathered information on efforts in Maryland, particularly at the Maryland State Department of Education, to foster effective professional learning on the state’s college- and career-readiness standards, the Maryland College and Career-Ready Standards. In collaboration with SREB states and national experts, SREB identified a set of expected state actions — “look-fors” — in four areas of state leadership in professional learning. 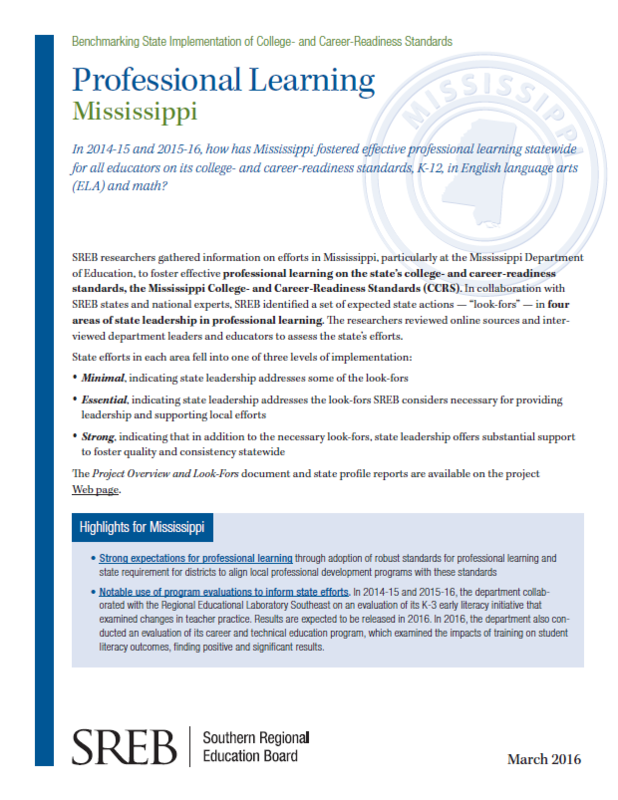 SREB researchers gathered information on efforts in Mississippi, particularly at the Mississippi Department of Education, to foster effective professional learning on the state’s college- and career-readiness standards, the Mississippi College- and Career-Readiness Standards. In collaboration with SREB states and national experts, SREB identified a set of expected state actions — “look-fors” — in four areas of state leadership in professional learning. 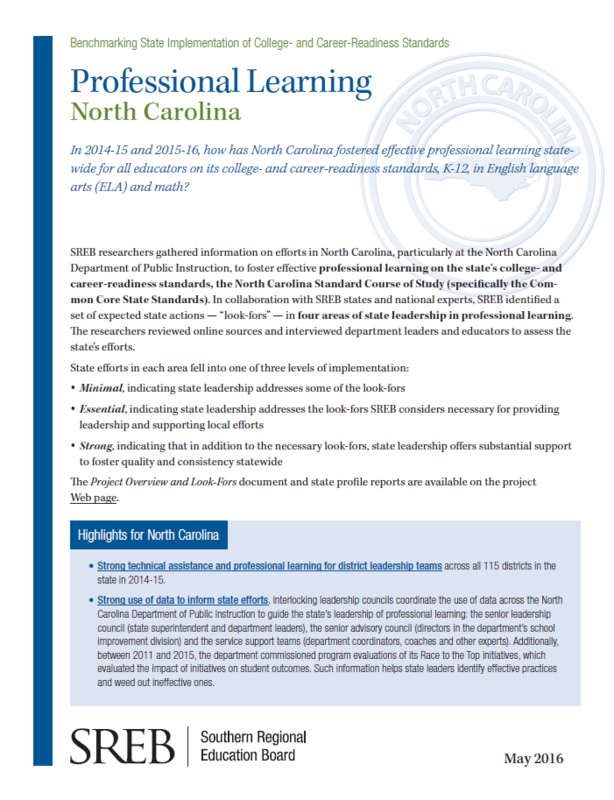 SREB researchers gathered information on efforts in North Carolina, particularly at the North Carolina Department of Public Instruction, to foster effective professional learning on the state’s college- and career-readiness standards, the North Carolina Standard Course of Study. In collaboration with SREB states and national experts, SREB identified a set of expected state actions — “look-fors” — in four areas of state leadership in professional learning. 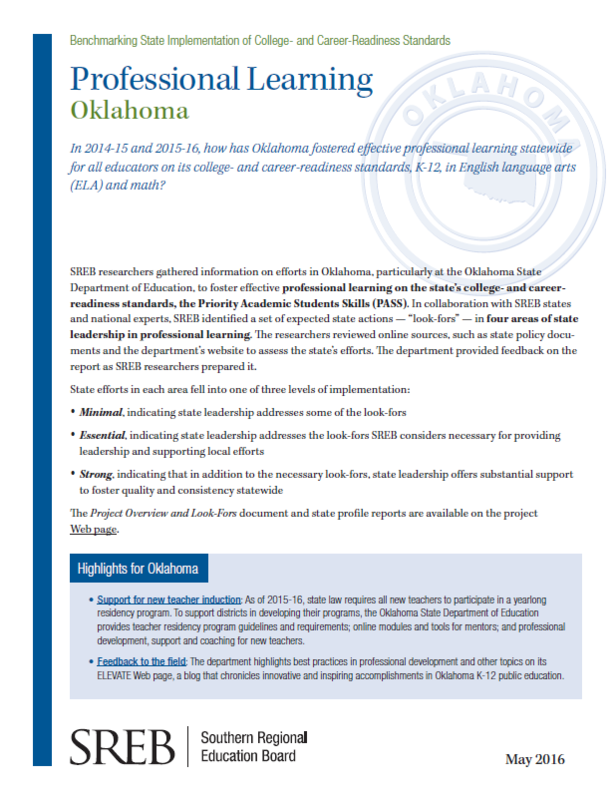 SREB researchers gathered information on efforts in Oklahoma, particularly at the Oklahoma State Department of Education, to foster effective professional learning on the state’s college- and career readiness standards, the Priority Academic Students Skills. In collaboration with SREB states and national experts, SREB identified a set of expected state actions — “look-fors” — in four areas of state leadership in professional learning. SREB researchers gathered information on efforts in South Carolina, particularly at the South Carolina Department of Education, to foster effective professional learning on the state’s college- and career readiness standards, the South Carolina College- and Career-Ready Standards. In collaboration with SREB states and national experts, SREB identified a set of expected state actions — “look-fors” — in four areas of state leadership in professional learning. 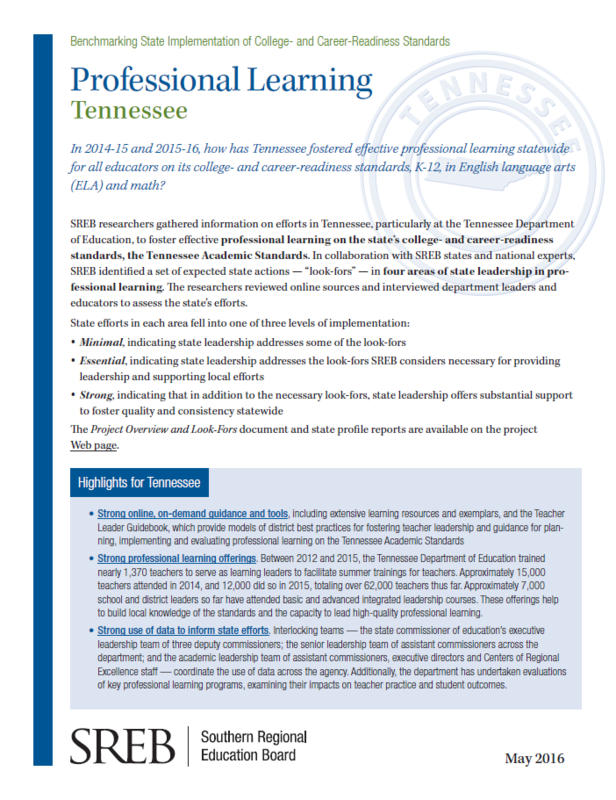 SREB researchers gathered information on efforts in Tennessee, particularly at the Tennessee Department of Education, to foster effective professional learning on the state’s college- and career-readiness standards, the Tennessee Academic Standards. In collaboration with SREB states and national experts, SREB identified a set of expected state actions — “look-fors” — in four areas of state leadership in professional learning. 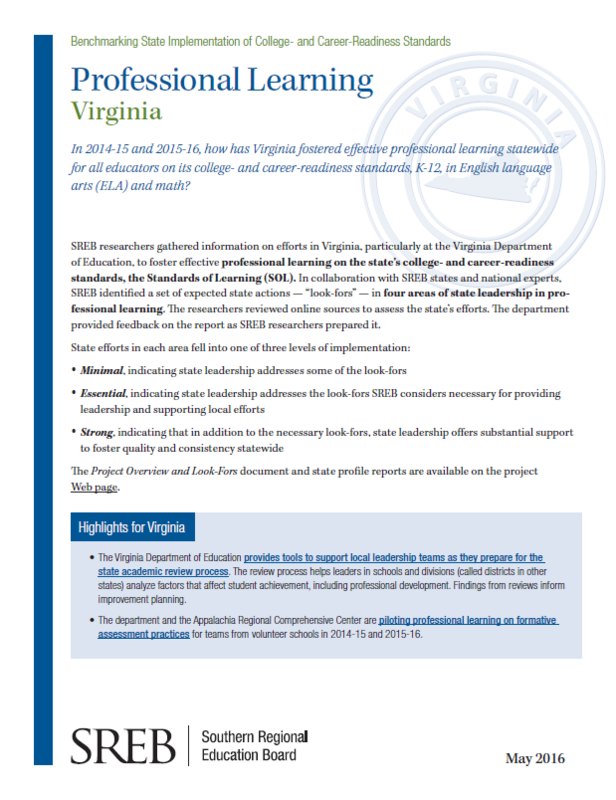 SREB researchers gathered information on efforts in Virginia, particularly at the Virginia Department of Education, to foster effective professional learning on the state’s college- and career-readiness standards, the Standards of Learning. In collaboration with SREB states and national experts, SREB identified a set of expected state actions — “look-fors” — in four areas of state leadership in professional learning. SREB researchers gathered information on efforts in West Virginia, particularly at the West Virginia Department of Education, to foster effective professional learning on the state’s college- and career readiness standards, the Next Generation Content Standards and Objectives (NxG CSOs). 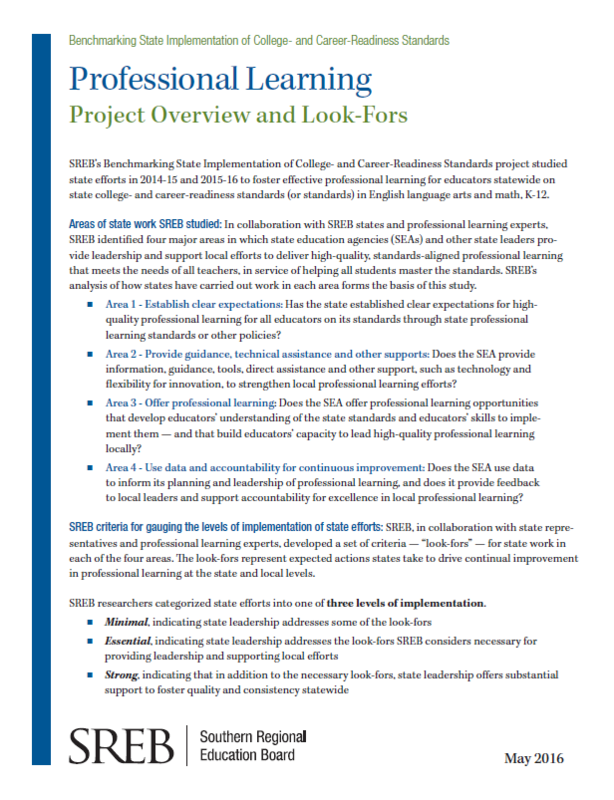 In collaboration with SREB states and national experts, SREB identified a set of expected state actions — “look-fors” — in four areas of state leadership in professional learning.